'"Running the library requires a brave person..."
Dita blushed. The more she tried to stay still, the wilder her trembling became. Her hands began to shake, too, and she feared the director might think her too weak for the job. "S-s-so you're not counting on me, then?" "You seem like a brave girl to me." "But I'm trembling!" she replied, devastated. Then Hirsch smiled in his particular way. "That's why you're brave. Brave people are not the ones who aren't afraid. Those are reckless people who ignore the risk; they put themselves and others in danger. That's not the sort of person I want on my team. I need the ones who know the risk-- whose legs shake, but who carry on." I'm just going to jump right in and say that this book is not for the faint of heart. This book is technically a youth fiction novel (based on real events and a real person) but we've moved it into the adult fiction section because of some mature themes and some scarce strong language. And because some of the descriptions are very intense and graphic. This book is a very real portrayal of what actually happened in the death camps to very real people (at the end of the story, there is a "what happened to them" page and it's all very interesting). So even though this disclaimer is out there, I still think youth could handle it. It's not sugar coated to make it easier for us to read, which I think is a really good thing. I'd say ages 15 and up, but every kid is different, so use your (the parent) discretion on what they can handle or not. This book is amazing. It is SO well written and, I say this about all the books I read and then review on here, but I honestly think that even though it's a "youth" book, I think it's important for you to read. This is a time in history that is awful and sobering and so so important. I never ever want to forget what happened and reading books like this one keep it fresh in my mind...no matter how hard it can be to read. 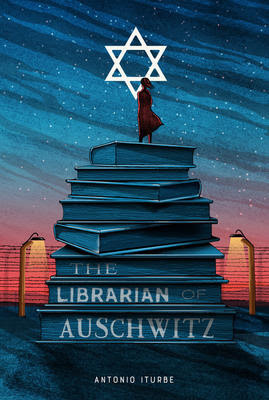 For more information on The Librarian of Auschwitz by Antonio Iturbe, visit our website here.